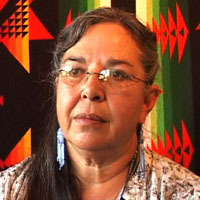 A certified teacher and administrator, Joyce Silverthorne retired as the Director of the Tribal Education Department for the Confederated Salish and Kootenai Tribes of the Flathead Indian Reservation in 2007 and is now a policy advisor at OPI. Over the years, she has made an enormous contribution toward implementing IEFA, working with school systems on and off the reservation and serving as a gubernatorial appointee to the Montana Board of Public Education for 10 years. Ms. Silverthorne’s interview with RLP focuses on the history and development of IEFA, and the challenges and successes of putting the language of the Act into action. Indian Education for All Becomes a Reality - Joyce Silverthorne. Developing Essential Understandings - Joyce Silverthorne. Working toward a Positive Understanding - Joyce Silverthorne. Hollywood Indians - Joyce Silverthorne. Ethnic Identity - Joyce Silverstone. The Traditional-Assimilated Continuum - Joyce Silverthorne. Intellectual Property Rights - Joyce Silverthorne. Working Together for Success - Joyce Silverthorne. Challenges in Implementing Indian Education for All - Joyce Silverthorne.